Bibliography: Not in Nagler (XXI, 188–90); see Ashton, Shakespeare and British Art (Yale 1981), cat. no. 49 on one of Fuseli’s versions of the painting exhibited at the Royal Academy in 1783 (10). 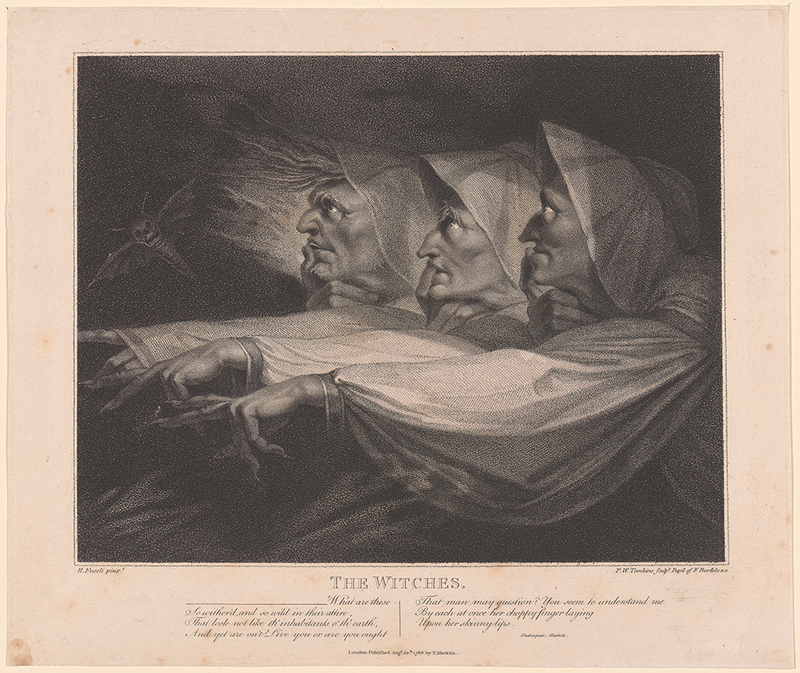 Related Works: Based on a mezzotint after Fuseli by John Raphael Smith; see also a variant caricature by James Gillray (English 1757–1815), “Weird Sisters,” 1791, DAC 1962.51.3. The Witches, . Stipple engraving on laid paper. Plate: 257 x 308 mm (10.1 x 12.1 in.). DAC accession number 1968.17.1. Purchase funds, 1968. Open Access Image from the Davison Art Center, Wesleyan University (photo: T. Rodriguez). http://dac-collection.wesleyan.edu/obj13460 is a persistent link to this page with no user-session information.